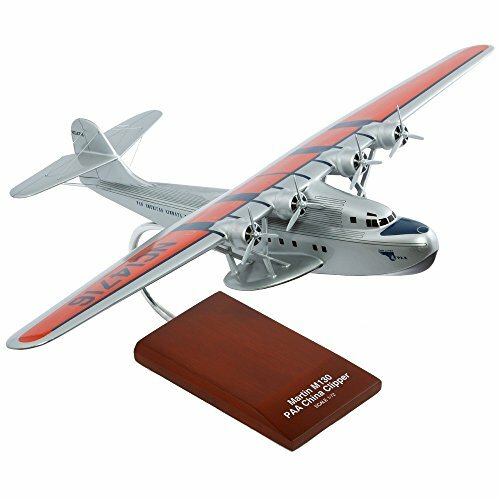 This high quality replica is handcrafted from mahogany and comes with a wooden base.Length is 15 an d wingspan is 21" "
Description: The m-130 was a commercial flying boat Designed and built in 1935 by the Glenn L. Martin Company for pan Am airlines. The m-130 was an all-metal flying boat which employed streamlined aerodynamics and powerful engines. 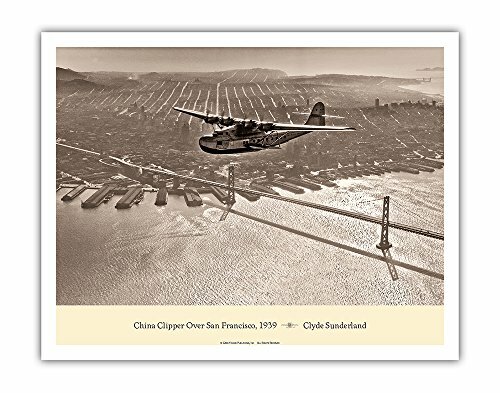 Only three m-130s were built: the China clipper, the Philippine clipper and the Hawaii clipper; but to the public they were all referred to as the China clipper. 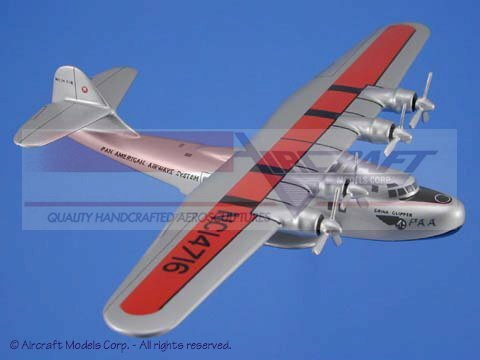 The China clipper name evolved into a generic term for pan am's entire fleet of large flying boats - the Martin m-130, Sikorsky S-42, and Boeing 314.This specific model is painted in the pan Am paint scheme. Pan American world Airways was founded in 1927 as a scheduled air mail and passenger service operating between key West fl and Havana, Cuba. The airline has become a major Company credited with many innovations that shaped the international airline industry, including the widespread use of jet aircraft, jumbo jets, and computerized reservation systems. This handcrafted model is painted in the same paint scheme as the original and is painstakingly built from Philippine mahogany by our skilled craftsmen. Perfect as a gift for any aviation enthusiast and history buff! China Clipper, 1935. /Nthe Pan American Martin M-130 Flying Boat 'China Clipper,' Leaving San Francisco On The First Transpacific Airmail Flight To Honolulu, Midway, Wake, Guam, And Manila, 22 November 1935. Photograph, Digitally Colored By Granger, Nyc -- All Rights Reserved. is a licensed reproduction that was printed on Premium Heavy Stock Paper which captures all of the vivid colors and details of the original. The overall paper size is 18.00 x 24.00 inches. This print is ready for hanging or framing and would make a great addition to your home or office decor. China Clipper, 1935. 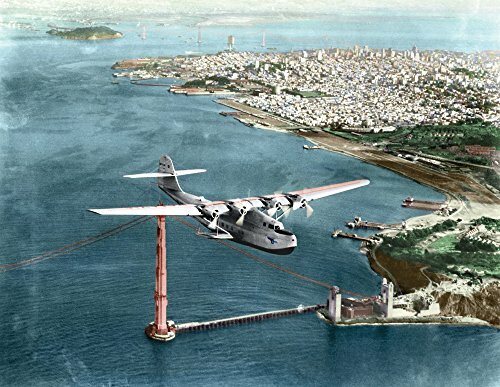 /Nthe Pan American Martin M-130 Flying Boat 'China Clipper,' Leaving San Francisco On The First Transpacific Airmail Flight To Honolulu, Midway, Wake, Guam, And Manila, 22 November 1935. Photograph, Digitally Colored By Granger, Nyc -- All Rights Reserved. is a licensed reproduction that was printed on Premium Heavy Stock Paper which captures all of the vivid colors and details of the original. 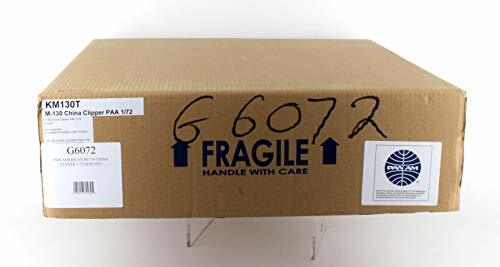 The overall paper size is 24.00 x 36.00 inches. This print is ready for hanging or framing and would make a great addition to your home or office decor. China Clipper was the first of three Martin M-130 four-engine flying boats built for Pan American Airways. In November of 1935 it was used to inaugurate the first commercial transpacific air service from San Francisco to Manila by way of Honolulu, Midway and Wake Island. It continued to fly the Pacific for the next eight years carrying approximately 3,500 passengers and 750,000 lbs of mail and freight. 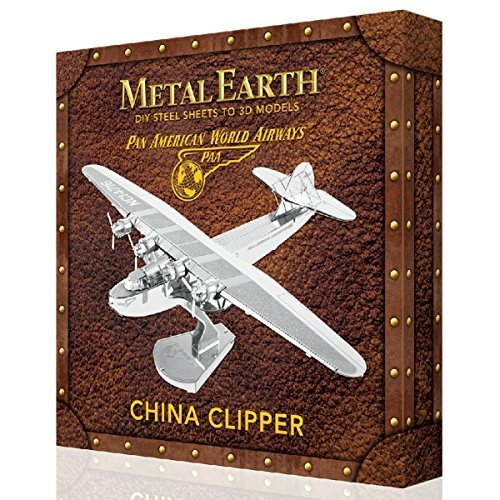 Shopping Results for "M130 China Clipper"